On 6/8/2018 Monday, Little Wittians of Jr.KG at Witty International School, Udaipur, explored the beauty of the blue colour. 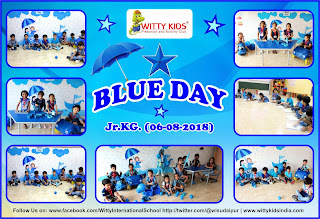 Children learnt about the majestic colour blue. The attire worn by the class teachers and children were also blue. The class was beautifully decorated with blue colour objects. Little Wittians were anxious to see different blue colour objects. Children learnt more about the colour blue through the slides and they enjoyed colouring the beach scene in the blue hand book. Blue day was a real fun as well as informative for the children.